From yesterday, a good summary of more recent research on the impact parents can have by taking kids’ gut microbiome seriously: Toddler Temperament and the Gut, Do bacteria in the gut influence behavior in kids?. Got me thinking as I prepare for my oldest of two daughters to start kindergarten after Labor day. One of the biggest challenges of trying to find the balance of feeding your kids what you think is optimal vs. convenient and socially the norm is that bread is such an easy and ubiquitous starch source. I don’t think we have good research on how all grains stack up but it seems like mass produced wheat is in contention for worst gut / autoimmune offender so why not avoid it? I know I’m speaking to quite fad at the moment and I generally don’t find myself following health trends.. but I think at this point it’s less trendy than making fun of people that are gluten free so I’m okay with it. Plus it can be more about what foods they should be eating than which they shouldn’t. That said now that my kids are both over two, while I worry less about this, I still enjoy putting in extra effort to keep them enjoying other starches / sources of daytime carbs. But often convenience needs to rule and for years I’ve worked up to being able to make muffins to the point where I can’t even remember what recipe I started with and I don’t need to do much measuring. I think it was the mini muffin tin tray though that made this something fun to make and experience over and over. Knowing processed flours* in general aren’t ideal I try to mix in as many ingredients I think they don’t get enough of as I can and still keep these tasty. I tried something new today after scoring some nice little zucchinis and carrots. In the past I’ve alternating through squash, bananas (and chocolate), pumpkin (and cranberries), etc. before, which probably have similar amounts of prebiotic fibre, but this twist adds a main ingredient that is quite a bit less sweet per weight or volume so it makes a better lunch companion vs. desert/snack. 1. Preheat over to 370. 2. 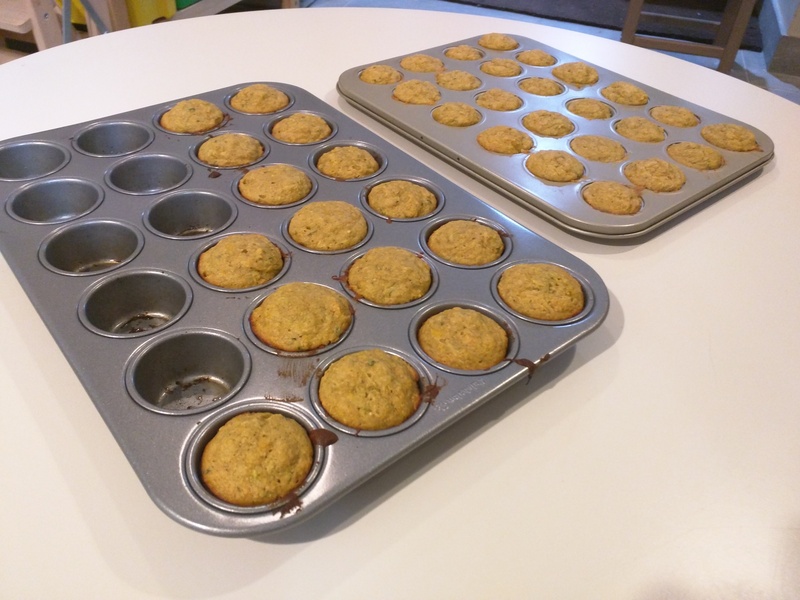 Grease (mini ideally) muffin pan. 3. Mix well, wet into dry ingredients with a spatula. 4. Dispense into tins and bake for 10-15 mins depending on the size of your pan. I don’t worry about a timer, just wait until you see a tiny bit of browning and then you usually have a few more mins. These freeze really well! The smaller ones they even like to eat right out of the freezer. What’s funny, but not really funny, is that at a Montessori school earlier this year I made a similar recipe into a sweet potato bread in a loaf pan and received the feedback from a teacher she would prefer I didn’t send slices of that because it didn’t look like familiar bread. “We don’t send sweets, can you consider sandwiches, pitas, etc.” I get the point on a couple levels from what they typically see and this is from a perfectly wonderful teacher, but it gets awkward when you both mean well (the contents of the food pyramid will die a slow death it seems..). It would be nice to meet more local parents with similar food interests but I don’t think the gluten free hipster trend transcends the inconveniences of parenthood. * Also keep in mind processed flours have water content removed so you want to make sure kids get plenty (of water) to drink. ** High fibre is not necessarily a good thing. We want prebiotic, non-toxic fiber and not the bran from most grains. 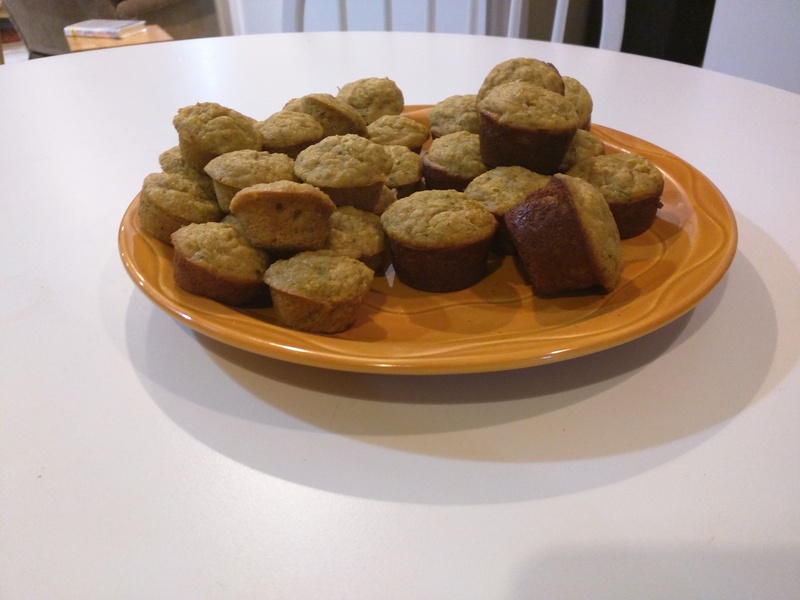 *** Unlike a lot of “gluten free muffins” recipes that use almond flower, I’m not really a big fan of that and prefer me some sweet rice flour or other alternatives. Baking with ground up almonds that have plenty of unsaturated fats to begin just doesn’t seem smart. I won’t get fully in to why you can’t find grass fed butter in Ontario/Canada, why grass fed butter is better, etc. 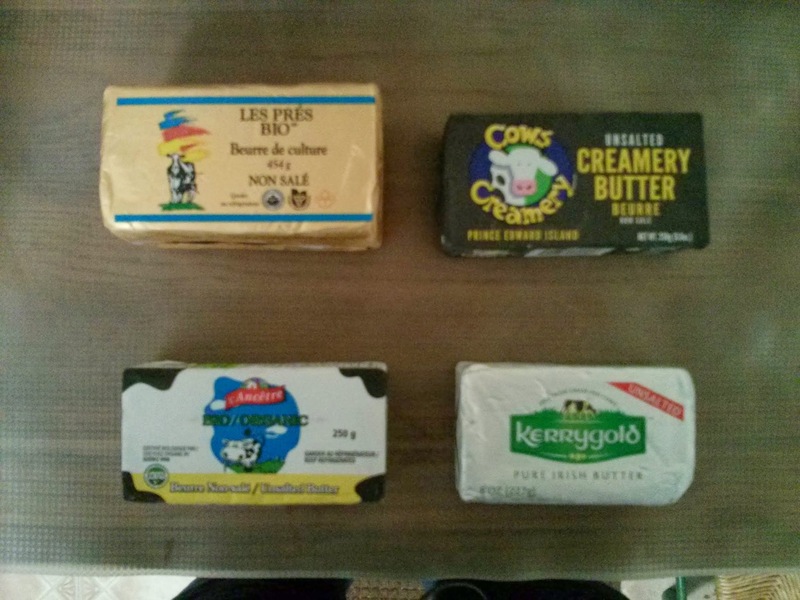 But I just wanted to share some info I’ve put together and share how I decided to choose the best butter for the $ available to me personally. First off I ended up finding some of the top butters I could realistically get my hands on and doing a crude visual analysis. Info on more local butter options below. I grabbed samples of (from top left clockwise) Organic Meadow (most widely available, at Loblaws etc. ), Cow’s Creamery (available at specialty shops- I got mine at Hooked on Queen East), L’Ancetre (tricky to find at Health food stores, I have been getting mine from ONFC), and Kerrygold (a popular Irish grass-fed butter that is easy to find when I visit the US). Kerrygold was the only brand I knew was actually grass-fed (apparently just mostly now). The other organic brands like Organic Meadow and L’Ancetre are known to be from cows that are mostly eating grass, especially seasonally, so I had a hunch that they might stack up fairly well in terms of colour to Kerrygold. See some pictures below. I was quite surprised how striking it was that L’Ancetre clearly had the richest colour. Given the solid brand reputation I was already aware of, this was pretty convincing that this is best brand I can buying and it isn’t ridiculously expensive (see below). Photos taken Dec. 4 2013 (obviously the date does affect the seasonal eating of the cows but I figured buying in early December a reasonable time). Like with eggs you are looking for a rich deep colour (yellow or orange’ish). 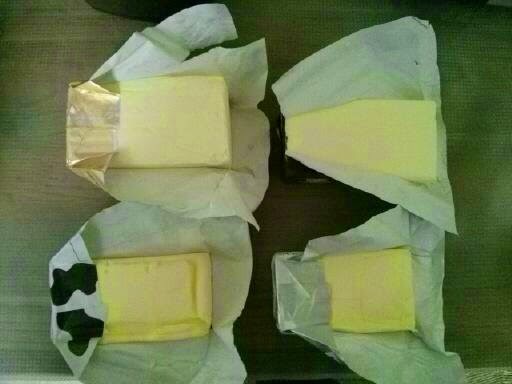 Butter made from cows that have only been fed grass (hay and sileage in winter) is NOT readily available in stores. There are some butters in the market that are organic and pretty good and at certain times of the year are from animals that have been on pasture (mostly) but may have received some additional feed. For truly pastured butter that is also locally produced, one would need to join a cow-share with a farmer that is trusted to keep the soil healthy, keep the animals in good health and milks and processes in a clean environment. Some of these farmers have extra milk and cream that they process into cheese and/or butter. Cow-share Canada has been training farmers to produce healthy milk that is not pasteurized and contains all the natural nutrients, enzymes and probiotics that are so beneficial to our health. You as a consumer need to make your decision in terms of which product you want to consume as there is no one best product and most of us have to also balance the cost of foods within our budget. • KERRYGOLD BUTTER is from Ireland and the animals are exclusively pasture fed. Not sold in Canada at this time due to import restrictions. 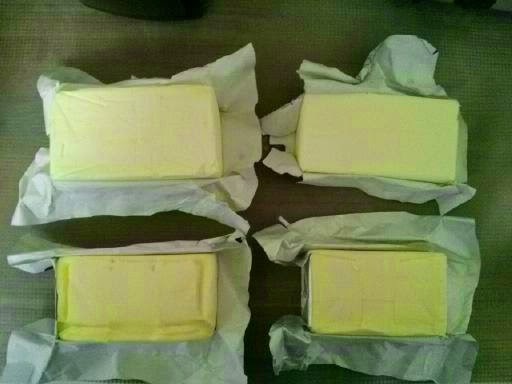 Pasteurized butter. In Canada, you can find all-natural Kerrygold Cheeses at the following retailers: Costco, Whole Foods, Safeway, Metro, Longos, Loblaws, Sobeys, Thrifty Foods, Overwaitea, Calgary Co-op and Quality Foods. • DEVON CREAM (47%MF) and CLOTTED CREAM (55MF) are produced from 100% grass fed animals with hay and sileage supplemental feed in the colder UK winter months. It’s not butter but so thick that you could use it to spread over home-made pancakes, crackers, toast, etc. I would not use it to make butter as the cost would be prohibitive. I have seen it sold at Fiesta Farms at 200 Christie St., 3 blocks north of Bloor. PRICE $ 5.99?? for a 6 oz jar. This product isn’t too hard to find. We bought one to just have in the fridge as a heavy cream backup… the expiry date was > 6 months which is pretty awesome. • ORGANIC VALLEY BUTTER FROM WISCONSIN is supposed to be fabulous! http://www.organicvalley.coop If anybody has an idea of how to get it into Canada or if you know of a store in/near Buffalo that sells it, let us know. They sell European (84% fat) cultured butter and Pasture Butter (salted) which is produced in small quantities and only seasonally. • L’ANCETRE BUTTER – this butter is made at a Creamery in Quebec. The cream is non-homogenized (but pasteurized) and is great for cooking, making ghee or just eating as is. Cows are NOT exclusively pastured but the pasture content is higher when grass is available. (May to October?) This is the butter that I buy the most. Available at Karma Co-op, Fiesta Farms, Big Carrot, Ambrosia, etc. I have been buying cases from ONFC to bring the price down even further to about $5.42 per 250 g ($65 for a case of 12). • BROOKERS in Schomberg – deliveries to Toronto for orders of a minimum of $ 100 – They advertise their butter as “unsalted grass fed butter” and it is pasteurized. Price is $ 14/HALF LB and they are presently OUT OF STOCK but I have been told by them that the product should be on their website again in a couple of weeks and possibly at a lower price. You can order online and they do offer delivery. Although when I checked they were out of stock, I would have to pass on the price of $13.00 per half pound. 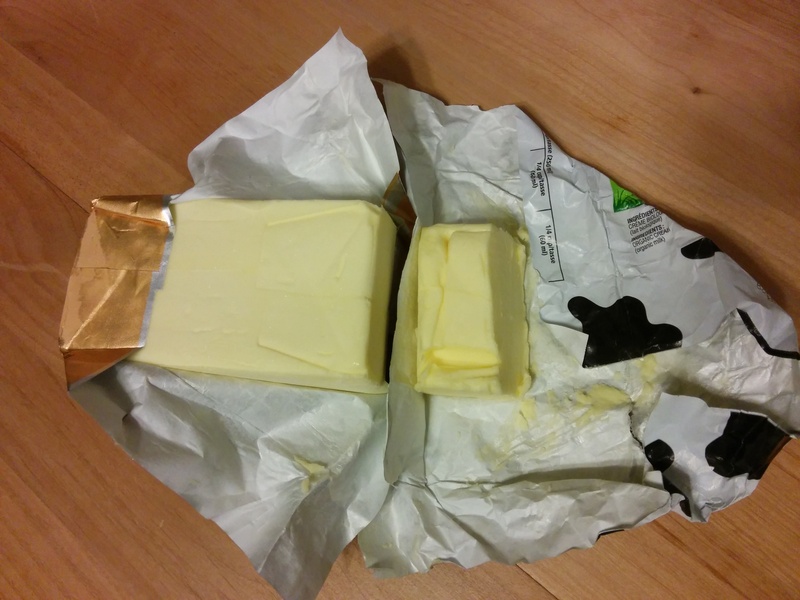 Here’s a forum thread with people buying Brookers butter. • ORGANIC MEADOW cultured butter, pasteurized. Company states that the cows are 95-100% pastured in the summer and 70 – 85% pastured in the winter. Additional feed is organic (non GMO) alfalfa, peas, oats, soybeans and corn. Widely available, including some Loblaws stores. Butter freezes well. If you find a good source, buy in bulk and freeze for later use. Making ghee is another way to preserve butter but also to remove proteins that some are intolerant to. Generally the organic butters in the Toronto market are decent. For even conventional butters the Canadian government fortunately does not allow growth hormones to be given to cows to stimulate milk production (in the US conventional milk may have growth hormones). Ask Whole9 Canada: Where can I find grass-fed dairy in Canada? Color isn’t everything but L’Ancetre looks pretty darn good comparatively especially considering it was purchased much earlier in the spring vs. the prime summer Organic Meadow. 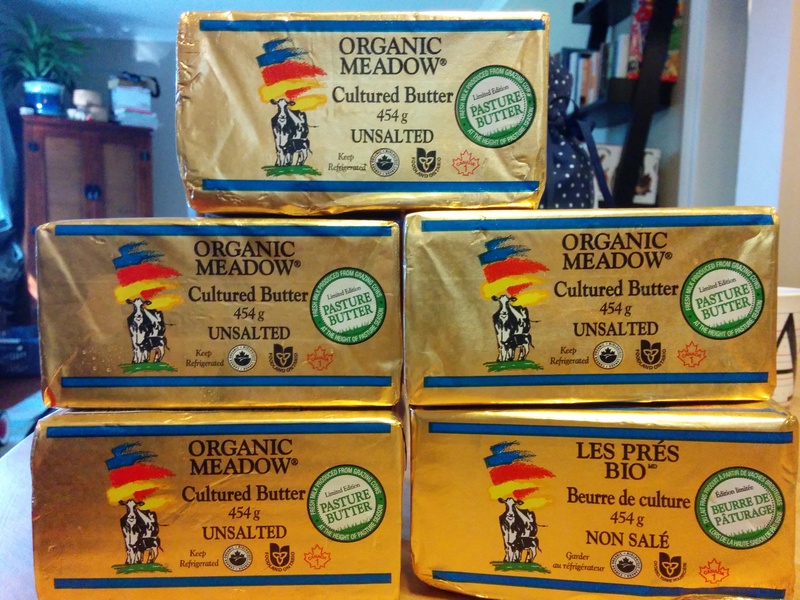 I would like to confirm whether Organic Meadow selectively labels or simply applies it to all their butter this time of year. Regardless it is nice to see a company appealing to savvy butter consumers.